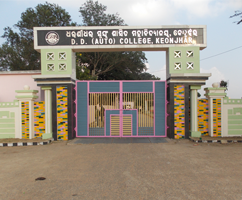 The objective of the college is primarily responsible for the development of the full potential of the tribal students and it makes them active participants in the mainstream of orisons life and culture and their education should also enkindle the ray of awareness, freedom from superstitions, dogmas and baseless beliefs. The college aims to become a kind of its own in imparting teaching to not only tribal ’s but also students who wants to be blended with a rich culture of Gurukul. The college spreads more than ten thousand square feet of plinth area and solid concrete structure with provision for almost all necessary facilities.